Three Gals and a Guy : Trauma Matters! I attended a three day conference this week: 4th Annual Psychological Trauma and Juvenile Justice: Trauma Informed Care- Impact on Body, Mind, Behavior and Community. It was one of those conferences that leave you feeling rejuvenated and remotivated towards the hard work we do each and every day. It also left me feeling a little helpless and discouraged as well as after all, I am just one person. The last day was probably the day that spoke to me the most. The keynote speaker was engaging and most of all a real, down to earth person. She talked about the impact of trauma on our society and how it has become a major public health issue. One of the statistics she shared with us all, stunned me. Working in this field, not much surprises me and I'm not sure why this statistic really stuck with me but it did. "Of the 76 million children in the US, 46 million are exposed to violence, crime, abuse, and psychological trauma annually, that represents 2/3 children." (From Defending Childhood: The Attorney General's National Task Force on Children Exposed to Violence, 2012). This blew my mind, that in our world, we are letting this happen to our children. Trauma is SO much more common that we thought and it is happening every. single. day. I think it also goes to show how right she was, that EVERYONE needs to know about trauma and how it impacts our lives- whether you work at McDonald's or are a CEO of a company. It also made me think about how we have dealt with the increase of violence- the shootings etc. Something tragic happens, it gets talked about, it's all over the news, then it's over. Until the next thing happens. We keep slapping bandaids on these problems and never getting to the real problem- the trauma that so many adults have experienced as children. People who are committing such terrible, violent crimes are getting slapped with handcuffs and go to prison. Is this really the best answer? It is so important that our society begins to shift it's way of thinking and begin looking at behavior through a trauma lens. 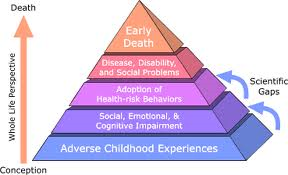 The ACES (Adverse Childhood Experiences) study http://www.cdc.gov/violenceprevention/acestudy/ shows the prevalence of trauma in childhood and its impact on health. The greater number your ACE score, the higher chance you have of having significant health and work implications in the future. When looking at the score sheet, I can already tell you have at least one on that list. I'm sure many adults today also can relate to this. While sitting there listening to the speaker, I felt a sense of anger, discouragement, and helplessness when hearing her speak about how our society is failing people. We deal with people by labeling them as a criminal or crazy without really asking what happened to them. I always have believed that someone's behavior is trying to tell us something and it's something I try to reiterate to child care teachers ALL the time. His tantrums, throwing chairs, hitting etc.. are all behaviors that are trying to tell you something. There's a reason for why we behave the way we do. The speaker also brought up the point of funding streams and how it isn't going towards early childhood education. Until recently, early childhood education was a very low priority for our policy makers. One of the biggest struggles I see in my work today is finding quality child care teachers. There has been a slow movement to hire teachers with degrees and education in early childhood (because we know that working in a "daycare" is just playing, right?) but we can only pay them $8/hour. A teacher with a degree won't stick around very long for that much. So we are left often times with teachers who, themselves, have significant amount of stress/trauma and expect them to provide a nurturing, caring environment for children, all the while trying to make their own end's meet on minimum wage. It is a big problem and the heaviness of it left me feeling a little discouraged to say the least. But then, I remembered another speaker whose presentation included a slide that said "JUST ONE PERSON" And I remembered, yes I am "just one person" but that's all it takes. Just one person to be that child's "person" and that's all it takes to make a positive difference. So while there is a lot that needs to be done, I can find hope that I can make a difference to at least one child in the work I do.